Microsoft’s latest Windows 10 preview offers up a good look at what the company is planning for the future of laptops and PCs. While Windows 8 was never received well by consumers or businesses, Windows 10 aims to make things a lot more familiar. We saw the new Start Menu when Microsoft released its first Windows 10 preview back in October, but things are changing rapidly. There’s more built-in apps, user interface changes, and a whole new touch mode designed for 2-in-1 laptops and tablets. Windows 10 is still a work in progress, but Microsoft is soliciting feedback and changing parts of its operating system before it ships later this year. While the company demonstrated a number of new features and apps during its Windows 10 event last week, not everything is in preview straight away. A number of new apps will debut in the coming months, and Microsoft plans to more rapidly roll out new builds of Windows 10 to testers. Until then, let’s take a look at what’s new in the second major Windows 10 preview. 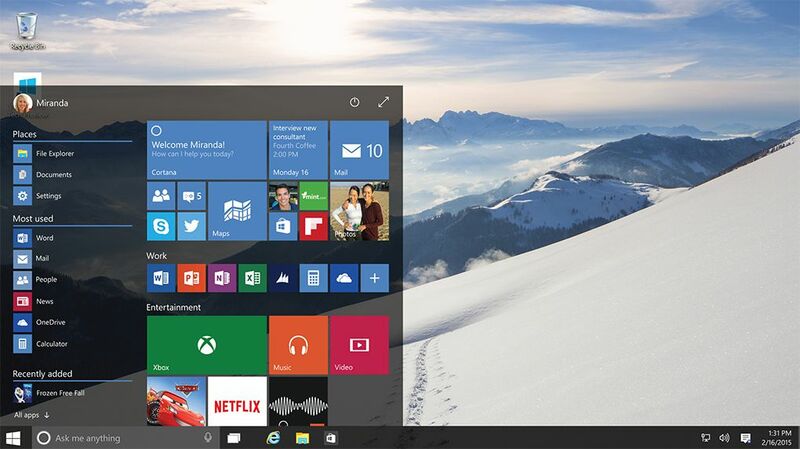 The look and feel of Windows 10 might be the key to its success or failure. With Windows 8, Microsoft swayed too far to adapting its operating system for tablets. It resulted in software that has largely confused the masses, but Microsoft is clearly fixing those mistakes in early preview versions of Windows 10. It’s still very much a work in progress, but the most noticeable addition is the return of the Start Menu. In the latest Windows 10 preview it’s clear to see what direction Microsoft is taking. 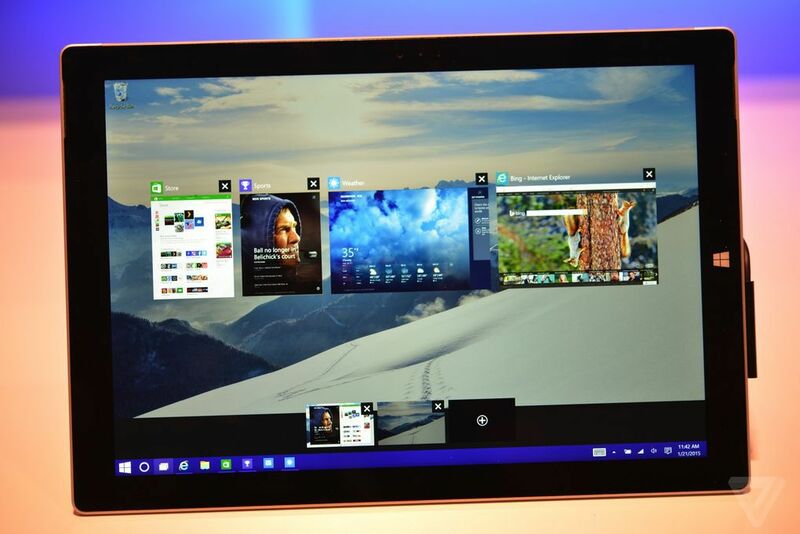 Windows 10’s Start Menu mixes legacy desktop applications with the new modern Windows 8 apps by surfacing Live Tiles. You can turn them off if they’re or annoying, or keep them around if you want to quickly glance at the weather, news, or various other information. While previous previews allowed you to resize the Start Menu freely, Microsoft has added a fullscreen option now which lets you expand the menu to make it look similar to the Start Screen found in Windows 8. The big difference is the presence of the taskbar at all times, which is a welcome improvement to enhance navigation between apps. There are some subtle changes elsewhere that help with app switching. In the past Microsoft has used a flip 3D feature to present a visual view of all applications currently running on a system, and the company is bringing it back, kind of. Swiping in from the left on a large tablet or a 2-in-1 will activate the new apps view, and it’s easy to use a mouse and keyboard or touch to select the app you want. In Windows 8 you had to navigate into the corners and activate a side menu with a mouse, and it was a rather irritating experience the more you used it. Those navigation changes extend to the Charms menu in the latest Windows 10 preview. It is gone and has been replaced by a notification center if you swipe from the right. Mousing into the corners on the right does nothing, but you can access the notification center (or Action Center as Microsoft calls it) from the system tray in the lower-right. It’s a bizarre change right now and lacks convenient access to settings like Wi-Fi or display brightness for laptops and tablets. Microsoft is balancing that with quick toggles for settings, but it feels like this particular area of Windows 10 needs some big improvements and is a very early form of what will eventually ship. Either way, the removal of the awkward Charms menu is an improvement, providing its replacement is tweaked heavily to keep some of the convenience of accessing settings and features like broadcasting via Miracast or DLNA. Microsoft’s design tweaks in Windows 10 and its built-in apps signal the direction of how this operating system will eventually ship. There’s lots of changes in the latest Windows 10 preview, and it appears that even Microsoft isn’t sure on exactly how Windows 10 will look in its final form. Some built-in apps have a hamburger menu, while the new beta version of the Windows Store has a mysterious back button for navigation. Microsoft is clearly testing the feedback on both, but it’s likely that the hamburger menu method will win out to help app developers easily port their apps from Android and iOS and adapt them for larger displays and form factors. 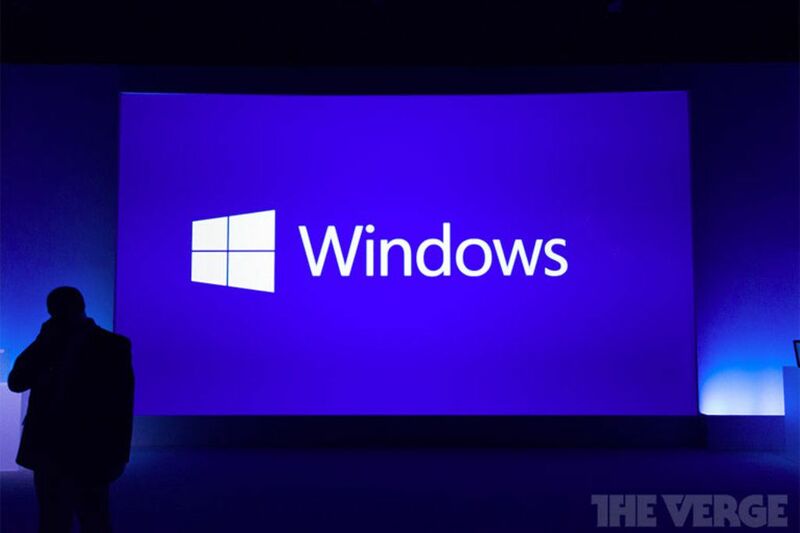 There’s even some transparency coming to Windows 10. 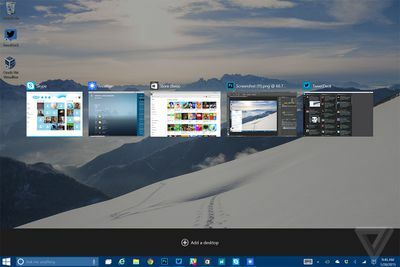 While Windows Vista first introduced Microsoft’s Aero glass interface with see-through windows and a transparent taskbar, Windows 10 appears to be returning to parts of that interface. Microsoft’s official press images for Windows 10 include screenshots of a transparent Windows 10 Start Menu, and Xbox chief Phil Spencer briefly showed the changes in a future build of the OS on stage at a press event last week. The transparent menu isn’t available in this current build — unless someone discovers a way to enable it — but we’re expecting to see it debut in later previews. Similarly, there’s also a new login screen that you can enable from the registry, round profile pictures, and even an improved calendar and clock for the taskbar that’s also available from a registry tweak. Icons have also been tweaked and look a lot more modern, and perhaps a little too colorful at times. Microsoft is also finally combining the control panel and separate settings app into a single app that looks a lot easier to use. The control panel still exists, but Microsoft is clearly pushing people to use the settings app as a replacement. Apps are the all-important feature of any modern operating system, and the latest preview of Windows 10 doesn’t disappoint. While Microsoft is developing a new universal Outlook mail app for phone, tablets, and PCs running Windows 10, that app isn’t ready for preview just yet. Instead, there’s a new Maps application and a touch-friendly version of OneNote. 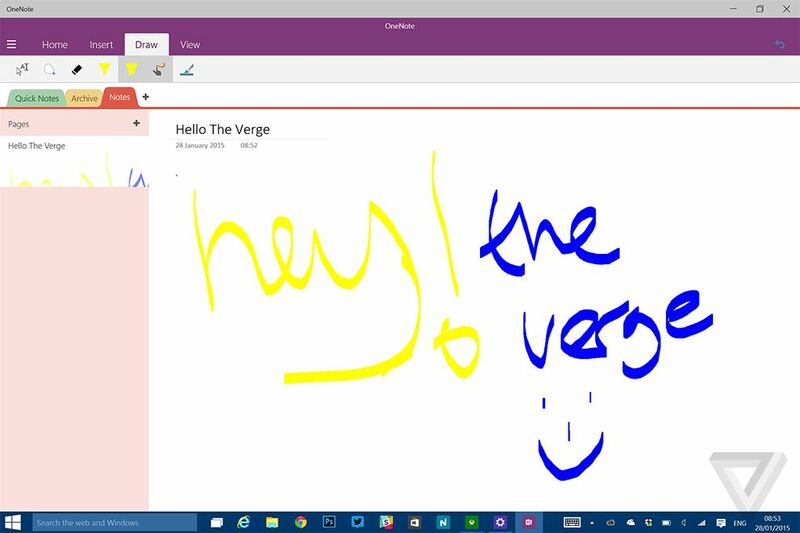 The OneNote addition gives us the first look at how touch versions of Word, Excel, and PowerPoint will work. It’s all very similar to the iPad version of Office, with a collapsable ribbon and formatting controls that work well with a mouse and keyboard or touch. This looks like a good example of how to build the perfect Windows 10 app. It’s fast, responsive, and resizes well to be a fullscreen app or one that’s windowed, which is something other apps lack right now during the preview. Getting developers to rework existing Windows 8 apps for Windows 10 might be a challenge. Some apps I tried were clearly designed to run fullscreen and not in a windowed mode, and one even asked me to “unsnap” the app before it would work, which meant running it fullscreen only. Given the lack of developer enthusiasm for Windows 8, this could leave some apps not optimized for Windows 10. However, the fact you can resize apps freely now may convince developers to adopt Microsoft’s new modern apps as an alternative to the aging legacy desktop apps. Microsoft is also previewing its new Xbox app as part of this new Windows 10 build. While SmartGlass exists to interact with Xbox Live and Xbox consoles, this new Xbox app feels a lot more geared toward gamers. In future preview versions and the final app, you’ll be able to stream Xbox One games from a console to a Windows 10 laptop, tablet, or PC and control them using an Xbox One controller connected via a micro USB cable. That’s a pretty powerful feature on its own, but Microsoft is also adding in game DVR capabilities to capture clips from PC games and the ability to chat over Xbox Live. I’ve found the app is particularly useful if you’re trying to matchmake in games like Destiny, as it’s quick to search for gamertags and message players. There’s even an option to invite someone to a party, although that’s not fully functional yet. 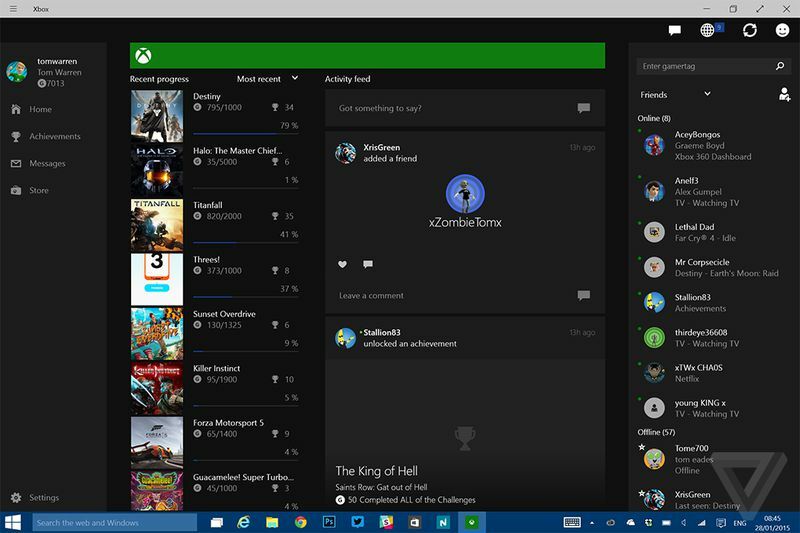 This Xbox app feels like the star of the Windows 10 show, and it’s a must for Xbox One fans. 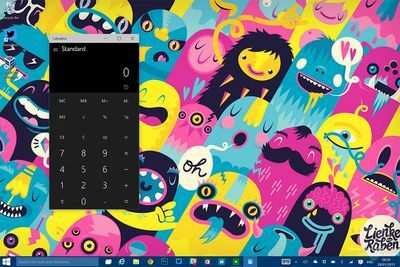 Interestingly, Microsoft is replacing calc.exe (the traditional Windows calculator) with a modern calculator. This cements Microsoft’s vision of universal apps as a replacement for desktop-only apps, but it also hints that the company may do this to other system utilities. Perhaps a modern version of MS Paint is on the cards, or even a fresh update to Solitaire. Notepad could also do with some modern love, but it still exists in its usual form right now. 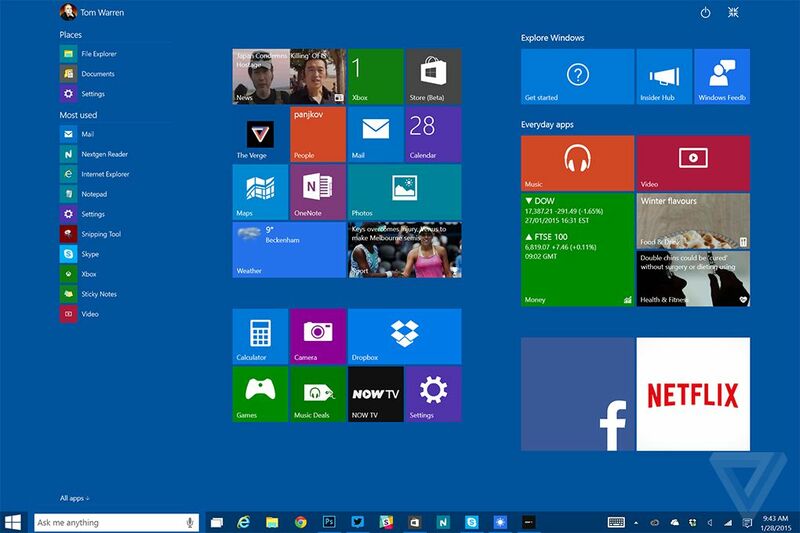 Cortana also makes an appearance in this preview version of Windows 10. 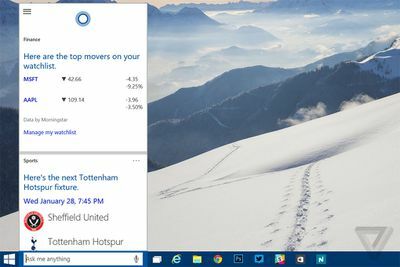 The digital assistant sits on the taskbar as part of a search box, but dynamically changes into the Cortana icon based on the number of apps that are open on a system (to make way for more taskbar space). As you’d expect, Cortana works almost identically to its Windows Phone variant. You can ask the same questions or set reminders, and there’s even a “Hey Cortana” option to trigger the assistant and search at any time. I was skeptical of having Cortana on PC, but I’ve found myself using the “Hey Cortana” option a few times to search when I’m not seated directly in front of my laptop and want some quick information like the weather or news. In future builds, Cortana will be closely integrated into the upcoming Spartan browser, a replacement for Internet Explorer. We’ve looked at how Windows 10 runs on 8-inch tablets, and it’s very similar to how it works on a desktop PC, but there’s a key “touch mode” in this latest preview that activates some interesting changes. For 2-in-1 laptops and tablets with removable keyboards, Microsoft is calling this feature “Continuum.” It’s all based on the idea that you can disconnect a keyboard or flip over your laptop screen to turn it into a tablet, and the user interface adapts to be a lot more touch-friendly. There’s a notification that triggers when you disconnect the keyboard on a Surface Pro 3 asking you to enter touch mode. You can dismiss it or click it to enable the mode, and all apps are immediately maximized (for traditional apps) or fullscreen (for modern apps). The usual snapping from Windows 8 is still here, and you can organize apps alongside each other. I like some aspects of this mode, but, like some other parts of Windows 10, it’s still a work in progress. Exiting out of the mode makes apps windowed, and you often lose the position of your desktop apps. On my laptop I often use apps maximized, but occasionally I’ll float some around and bunch them up. To lose that carefully constructed arrangement is annoying, and Microsoft will have to find a compromise that works better. Either way, it’s a good approach, and there’s even a new fullscreen toggle on the top part of modern apps that makes the taskbar disappear and makes an app truly fullscreen. The implementation feels a little early, but it’s encouraging to see Microsoft adopt fullscreen controls that are easy to understand and activate. Future preview versions of Windows 10 should demonstrate an even clearer path towards the final version of Microsoft’s new operating system. An improved Xbox app is on the way, alongside preview versions of Office apps and Microsoft’s upcoming Spartan browser. All these additions should give us a better look at how Windows 10 will work once it ships later this year. Microsoft is clearly incorporating feedback at every opportunity, and we suspect there will still be some significant design tweaks and changes that make Windows 10 feel a lot more complete. Microsoft appears to have finally got things right here, and Windows 10 makes a lot more sense to those who are used to the days of Windows XP and Windows 7. It’s more familiar and modern, with a focus on improving the ways people actually use Windows today. We’ll keep a close eye on Microsoft’s progress to shipping Windows 10 later this year, so stay tuned to The Verge for continued Windows 10 coverage in the coming months.